Just back from an evening in Vegas where we met most of the guys who are hanging around the Internet, always a pleasure! Tonight we had the opportunity to get our hands on the new Optio MX camera. Actually one of the friendly girls laid her hands on it and I took some product shots, but never mind. 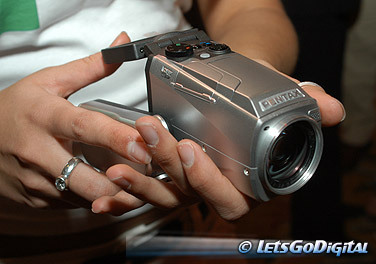 Pentax USA has announced the introduction of the first Pentax digital still/movie camera. This innovative, palm-sized Optio MX features 3.2 effective Megapixels and 10x optical zoom to capture still images and high resolution (VGA) full motion movies on MPEG4 format with zoom capability. With advanced design and the compact dimensions of the Optio line of digital cameras, the Optio MX features an ergonomic grip handle and an articulating LCD monitor that swivels horizontally and vertically to frame subjects exactly as you prefer. 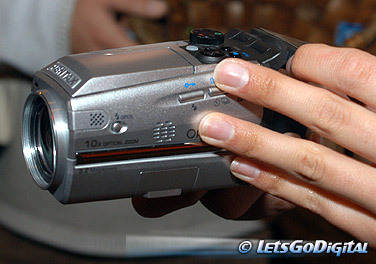 The new Optio MX is the first step into the production of full-capacity digital video and has a price tag under $400. For optimal results in panoramic settings, a wide conversion lens will be available as an accessory to the Optio MX. The new Optio model will ship to dealers in June 2004. The new camera will be showcased tomorrow during the PMA show. Tomorrow is the day that the show kicks off; we will see a big announcement from Olympus and later on that day from Konica Minolta where we will learn more about a product that has been highly awaited for by a lot of Minolta fans! So stay tuned and learn more about the excitement on the show floor as we will bring you more news in the upcoming hours and days!